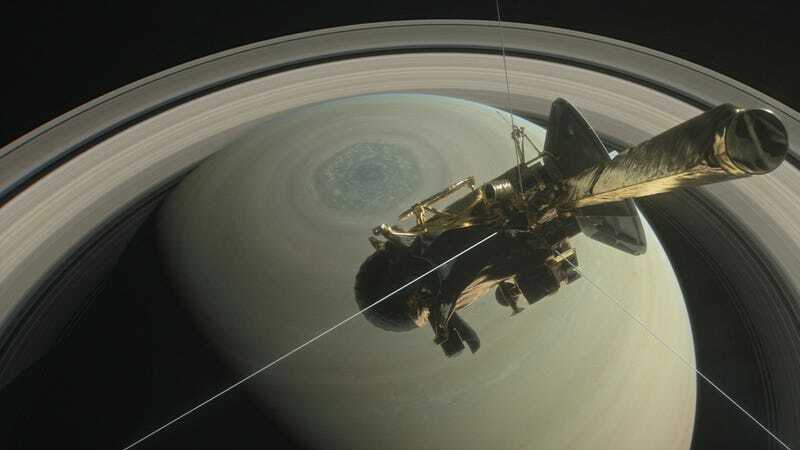 According to NASA, Cassini took 21 photos within a span of just four minutes on August 20th. Due to the vantage point of the wide-angle camera, it’s a bit tough to make out each of the big rings, but the most dedicated among us can see the ghostly C ring and brilliant B ring. An especially astute viewer will also notice the Cassini Division, or the 3,000 mile (4,800 km) gap between Saturn’s A and B rings. (Here’s a detailed walk-through that explores the location of each ring and their individual properties.) And no, you may not name your band “Cassini Division” because that’s what I’m calling my space goth Joy Division cover band. It’s hard to look at the movie—or any of Cassini’s hauntingly beautiful images—and not think of something appropriately morose for its Grand Finale. I personally recommend syncing this video with the “Tears in the Rain” monologue from Blade Runner. Hopefully, these last few weeks of Cassini’s life will be its most memorable—we’ll be sad to see it go. Cassini&apos;s First Grand Finale Images Are Stunning—But What Are We Really Looking At?